Participants will be given a 9 week training plan and proper coaching in a group training environment to prep for the 2019 Shamrock Run. Learn about form, injury prevention and how to increase speed and distance safely. Price of race not included in program, participants must register for the race separately. 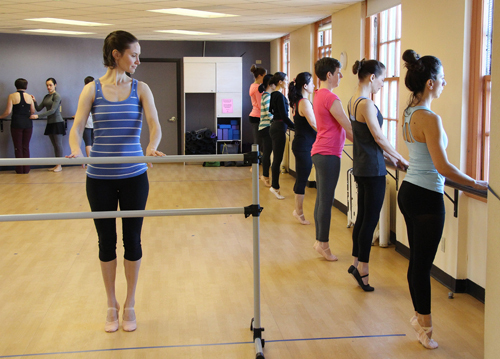 Learn fundamental ballet vocabulary and proper execution of graceful ballet steps while performing exercises to strengthen, lengthen and tone muscles; improve balance; and develop a strong core. Non-traditional ballet music will push the class and keep the energy flowing. Learn to lift weights and exercise to get stronger and move better. We’ll practice strength training as a group, and customize the workouts to fit each individual’s needs. At the end of this course, you’ll be ready to take charge of your own fitness with confidence. Sign Up – Sign up by March 29! A dance based workout for Active Older Adults. Regardless of your dance experience or fitness level, come move with us! A combination of resistance, circuits, endurance and mixed cardio that will get you whipped into great shape fast. Using an elevated step for this cardio class, you’ll get that heart rate pumping. Step is optional. End the class with strength and flexibility exercises for a well-rounded workout. Challenge yourself with cardio moves and all-over strength. This class combines interval drills, functional strength moves, core fusion, and increased flexibility. All levels welcome, come join the fun! Get your day started with an energizing combination of core, flexibility and cardio. All levels welcome. Use body weight resistance and boot camp style drills for a full high intensity cardio and strength building workout. Push and challenge yourself to a new level of fitness. Led by Members, participatns use resistance machines in the first-floor Fitness Room and work on gaining strength, lean muscle mass, and keeping metabolism revved up. Equipment Orientation is highly recommended prior to taking this class. Pickleball is a racket sport in which two to four players use solid paddles made of wood or composite materials to hit a polymer perforated ball over a net. The sport shares features of other racket sports, the dimensions and layout of a Badminton Court, and net rules similar to tennis with a few modifications. Get ready to sweat, build heat and burn calories in this fast paced and energetic class! A low to moderate intensity class designed to stregthen, tone and improve muscular endurance. Includes agility, flexibility, balance, cardio and other challenging exercised. Results are created by stimulating all muscle groups. Weights and bands are coupled with body weight resistive exercises in this full body class designed for all levels of fitness. Crank up the music and dance your heart out because this class is far more like a party and less like a workout! Don’t worry if you haven’t danced in years (or at all for that matter). 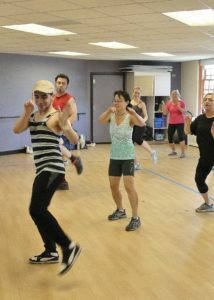 Zumba Fitness® is Latin-inspired dance fitness program that has become the cardio go to class for people of all shapes, sizes, and ages. All Ages Zumba is coming back – look for dates here! Bring friends and neighbors and join Marlon & Karlyn for a fun-filled hour of Zumba (your guests are free)!